Our preparations to have at Spain go well. Queen Puss is most amiable to the Earl of Essicks. And to Sir Water Rawly [Walter Ralegh]. He has his old place as captain of her guard again. She chased him from it after he offended her by marrying another Puss. I do not believe the Puss he wed will ever win back her place in the Queen’s household. My lord was never so high in the Queen’s favour as to be offered employment by her, but he hopes his service against the Spanish might give her a better conceit [opinion] of him. But oh, how troubles come! My lady Moll’s husband Thoms (he of the Imperial Dog Collar, but no employment) has brought fresh scandal on us all. Some say that Thoms has harboured cheese-wits [Jesuits], and sent Catlick spy newes to the Emperor whose dog he is. 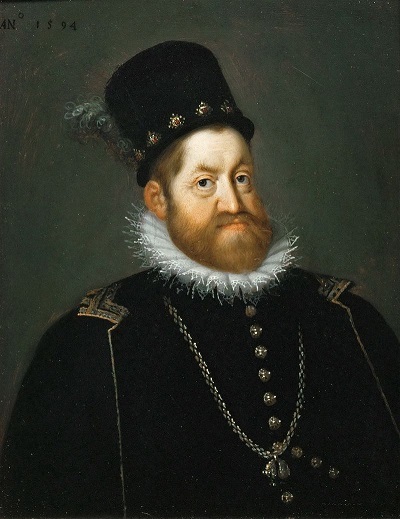 Rudolf II (1552-1612) – by Joseph Heintz the Elder. He created Thomas Arundell a Count of the Holy Roman Empire in reward for his military service. 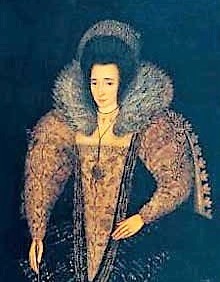 Arundell’s acceptance of the honour (his “dog collar”) infuriated Queen Elizabeth. Thoms and one of his friends were taken up for examination. Another of Thom’s friends, a small man, has hid hisself, for fear he might be stretched [on the rack]. I arrkst Linkin our Law Cat what he’d heard of this. “By folly, mean you his dog collar or his religion?” arrkst my niece. “Not sick,” sayt I. “Suttle.” For I do not believe my lady Moll is weak. I think she fayns [feigns] it, in hopes of seeing her husband freed. Linkin had more to tell. The River Fleet, from a 1572 map of London. The prison (I think) was on the east side above Fleet Street. Possibly the building in the upper half of the picture which sits beside the river and curves around the crescent? Thoms’ friend that was taken is confined in the Fleet prison. There is a stinking privy not two feet from his door. He must light a candle if he wants to write after three of the clock. He sayt that if Her Majestie could see him there, she would pity him. But Queen Puss don’t grace her prisons with her presence. So this fellow writes to Mr Secretary [Sir Robert Cecil] telling of all he did to find the small man and perswayde him to offer hisself for questioning. Which the small man would not do. Instead, he demanded money from my lady Moll. She gave him none, saying it was against her will that Thoms ever entertained him. Talk of Thoms always makes us merry. Linkin then told how Thoms had writ to Sir Rabbit Cecil, saying the small man was nowt but a private soldier whose akwayntance he’d made in Hungrie [Hungary]. 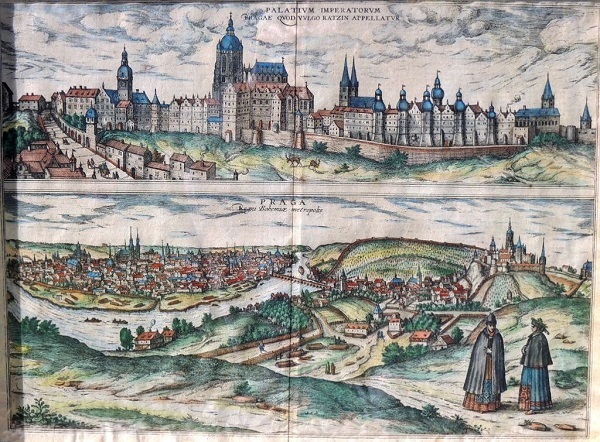 Thoms learnt that the small man meant to travel to Prague to collect pay he was owed. And Thoms arrkst him to carry proof of his pedigree to the Emperor so that he should know he had not conferred an honour on a base person. Thoms’ old father does not like his son, and he hates my lady Moll. How Linkin’s mistress must have enjoyed her lawyer son’s visits and news. He seems to have had a reliable source in the Cecil household. Linkin doesn’t always get the details right. The elusive “small man” was named Smallman. Being of inferior social status to Thomas Arundell and Sir Humphrey Drewell/Druell, he may well have been at risk of torture if he were thought to be part of a pro-Spanish Catholic spy ring. While I feel for Sir Humphrey in the Fleet prison, I can see why Gib and Linkin find the Arundell saga so entertaining. The letters from this latest episode, through May and June 1597, are in the Calendar of the Manuscripts of the Marquis of Salisbury (“the Cecil papers”) Vol VII, available on line. Humphrey Drewell was indeed at Titchfield during the escape of the Danvers brothers in 1594. He was with John Florio, the young Earl’s tutor, in the Itchen-Southampton ferry when Florio threatened to throw the sheriff of Southampton overboard. In 1596 he took part in the Cadiz expedition, and was knighted there by Essex.